Maltese Banter on anything Environmentally or Culturally interesting! Game of Thrones is an HBO fantasy drama adapted from George R. R. Martin’s novel series A Song of Ice and Fire. Despite a ‘soft’ first season release in 2011, anticipated mainly by fans of the novels, the show quickly achieved mainstream commercial and critical acclaim. In what would could only be described as a stroke of luck, Malta was selected as a filming location for the first season based on its abundance of natural and cultural locations that embody the fictional continent of Westeros. However, a filming choice sanctioned by the Malta Environment and Planning Authority led to an environmental catastrophe, causing HBO flee the island to more professional working pastures. Please take us back HBO! We promise to behave this time round. The prominence of Game of Thrones is not only exemplified by its list of accolades (including several Emmys and a Golden Globe Award), but also by its worldwide distribution. With an ever growing fan base, every new season boasts a marked increase in viewership – rising by 20% between the second and third seasons. HBO parent company Time Warner have reported that the series averaged 14.2 million viewers per episode in 2013, inching it closer to passing The Sopranos as the most watched HBO series of all time, and expected to claim this title at the end of this year’s fourth season. 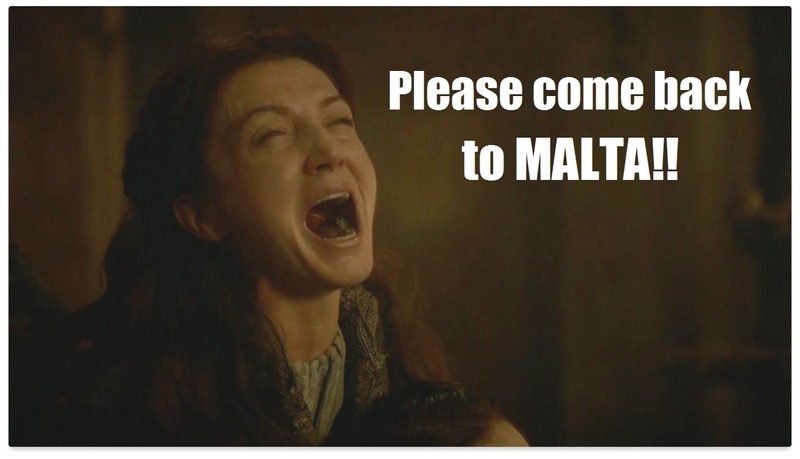 In anticipation of the premier of Game of Thrones Season 4 on Sunday 6th April, I think it would be ideal to recall Malta’s best missed filming opportunity: After filming Season 1 in Malta, a protected area was damaged, the production company was blamed by Malta’s environmental authority (MEPA), production moved to Croatia instead, and Malta missed it chance at a lucrative filming deal and free publicity! 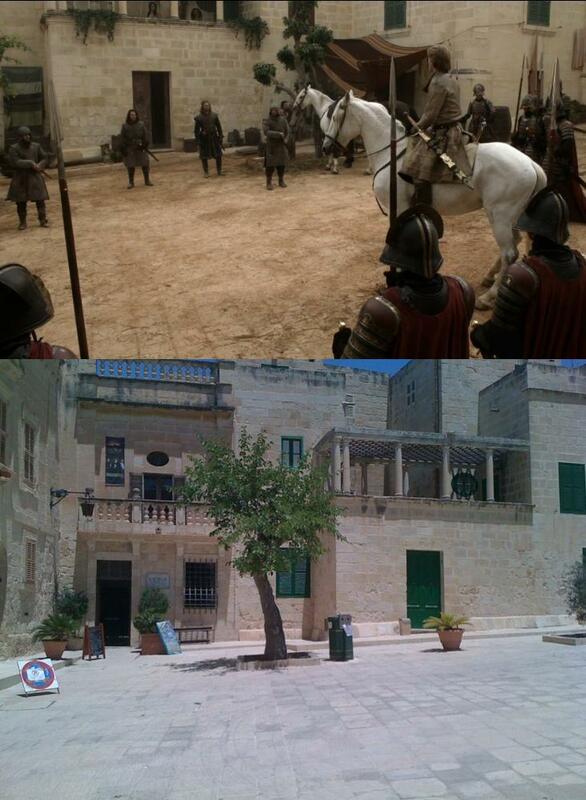 Filming for the first season began in Malta in autumn of 2010, where scenes for King’s Landing (including the Sept of Baelor and the Red Keep) and the Dothraki Wedding (including Magister Illyrio Mopatis’ house) were filmed. Given the diversity of regions in the fictional continent of Westeros, some of which are found in Malta, the local filming industry could have easily positioned itself in a long and fruitful relationship with HBO throughout the continuation of the series. However, filming took a sour turn when sandy material laid in Dwejra Heritage Park, a protected area, during the filming of the Dothraki Wedding adhered to the rocks beneath. (Above) Game of Thrones Season 1 episode 1 showing the Dothraki Wedding scene and the sediment that was deposited in the protected area. Dwejra is characteristically known for the Azure Window also pictured above. (Below): an aerial photograph showing the filming site (circled in red) before filming occurred. 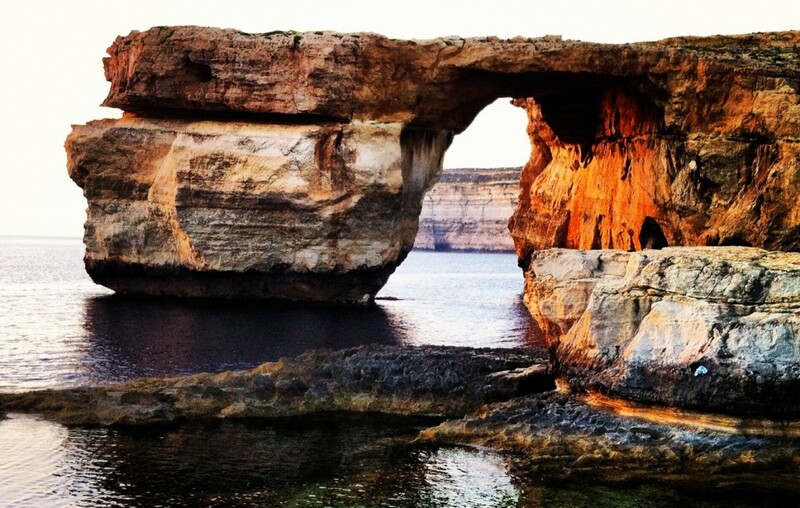 Producers of the show were given the green light by MEPA to lay sand over the rocks near the Azure Window, a situation which created “outrage among residents and environmental NGOs who [became] worried that the protected fossil-rich area may [have been] severely damaged”. The production company failed to comply with the permits issued, using a permeable membrane (pictured above) to cover the protected land area from the sand. The sand seeped through, causing it to become cemented onto the land beneath. MEPA claimed that the production company failed to adhere to the necessary permit requirements, and that it used damaging heavy machinery during the initial clean up processes. The saga ended with a local production company shouldering the blame for the entire disaster, in which it was fined €36,500 by local authorities. As generally happens in Malta, this incident subsequently pushed MEPA to propose new conditions for all filming permits issued thereafter. MEPA’s role in this filming fiasco has much been debated in the local media, with lots of tiptoeing around the issue. MEPA even admitted that in had not been present during the laying of the sand, which it blamed on the production company for not informing the authority sufficiently in advance. In any reputable country other than Malta, Environmental Agencies would shoulder the responsibility of such events. Instead, MEPA stated that ” it [is] impossible for Mepa enforcement officers to be always present during any form of development” – Oh Please. Such comments merit a Westeros style ‘beheading and a public display on a pike’. It must have been logistically impractical to have MEPA environmental officials on a site that is going to be altered to such an extent – whilst keeping in mind that Dwejra is a candidate UNESCO World Heritage Site, part of the Natura2000 framework and locally classified as an Area of Ecological Importance (AEI), an Site of Scientific Importance (SSI), a Special Area of Conservation (SAC), a Nature Reserve, a Bird Sanctuary and also boasts an adjoining Marine Protected Area (MPA). Of course MEPA is to blame, since this case was unequivocally unique – filming requests of this magnitude and specialisation do not happen every other week in such protected areas. To add insult to injury, then MEPA director Michael Seychell stated that the tampered site was simply ‘bare rock’, so there was no cause for concern. This is obviously another attempt at mitigating the damage caused to the site. The Game of Thrones filming incident was a major MEPA gaffe, that undoubtedly caused damage to a protected area and made HBO flee Malta faster than Samwell Tarly running away from White Walkers. Whilst I am highly anticipating the premier of Season 4 of Game of Thrones, I am gripped with a small sense of melancholy at the thought of not seeing Malta representing Essos and Westeros – would it not have been awesome to see the Grand Harbour in the Battle of Blackwater Bay? Alas that will never happen, all because Malta has an incompetent and irresponsible Environmental Authority. Imagine if Deborah Schembri starts chairing the House Environment Committee? It was a total disaster. I wrote the original piece regarding this in the Gozo News after being tipped off to what was happening by a friend and racing down to Dwejra with my camera. I couldn’t believe what I saw there. It was sickening to think that MEPA in that instance had reached a whole new level of incompetence even for them. One thing I would say by way of correction to the above was that the material dumped on the fossil bed was not sand as stated. If it had been sand brought in from another area that would have been bad enough but what they actually used was quarry dust which was why it reacted with the rain and solidified. 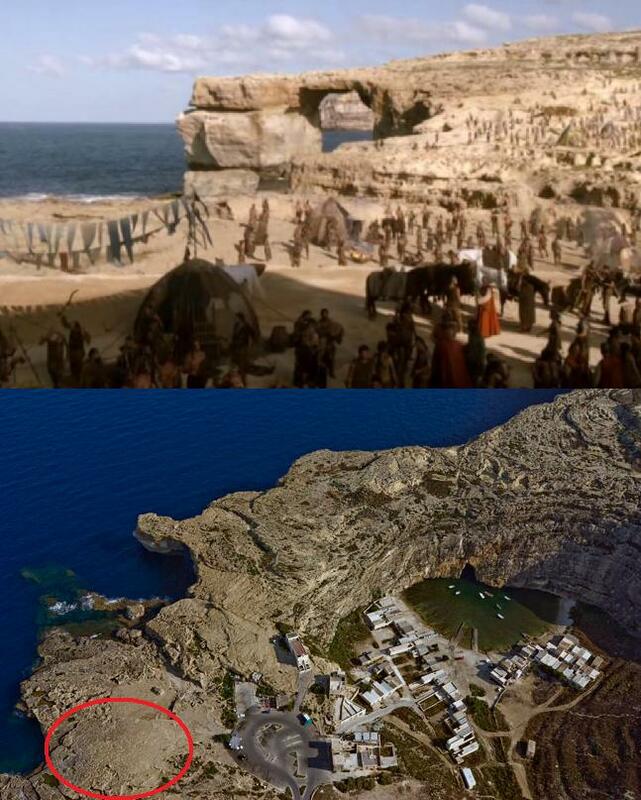 I have been told by many friends that Game of Thrones is really worth watching but because of what they did to one of my favourite places on Gozo I have never been able to watch it. Many thanks for your comment. I am aware that the material used was quarry dust, I had simply been using the terms ‘sand’ and ‘sediment’ interchangeably. Despite this unfortunate event, the filming company was quite professional in their work in Malta (I have friends who have worked on the production), and I am confident that the producers did not want such bad publicity. The show is definitely worth watching though! Maybe sometime I’ll get around to watching it. I just don’t want to look at them on the fossil bed knowing what happened. Makes me sick just thinking about it. You know that the rock still has a red tinge to it? Yes I do – I have visited the site on many occasions after the incident. Personally, I feel a greater sense of animosity towards MEPA than the actual show. As I said in my post, if filming went smoothly as originally planned it could have been a very, very lucrative opportunity. Oh I agree with you there. MEPA are the most incompetent authority in Malta. So you’re putting this solely on MEPA, but who’s bright idea was it to A) use quarry dust, and B ) use something as a barrier that had even the remote possibility of bleed through? I’m going to assume that MEPA arranged the cleanup, so they’re not completely blameless, but seems to me that if whomever chose the ‘sand’ to lay down, and what to lay it down with, is partially to blame, whether that was the production company, or whether MEPA did that themself. The Dwejra was yet another classical case of ‘learning from our mistakes’. After this incident, MEPA beefed up its presence through enforcement officers at other film sets, including the Brangelina one (http://www.timesofmalta.com/articles/view/20140710/local/Seven-Mepa-officers-are-monitoring-Jolie-s-movie.527047). As the main authority tasked with managing and safeguarding this site, they should have been present on the day this sediment was applied to prevent the incident from occurring in the first place. If I recall, the government had subsequently revised the manner in which filming permits are issued following this incident. So yet, I solely blame MEPA for sheer lack of monitoring and enforcement. What an unfortunate thing to happen to any country. A place of that importance should have been protected very well. It should have been minded by proper authorities and if need be to supervise it entirely to make sure that the area is protected well. A s a GOT fan it is simply devastating yet I do hope all is well with everybody. If you like my work and are looking for a researcher, copywriter, or content editor, Click Here!